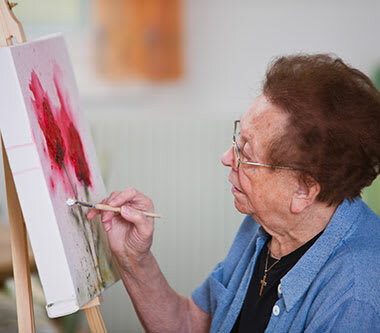 Specially designed for people with dementia, our personalized, life-enrichment activities maximize independence while focusing on individual strengths and abilities. Our community is set up for safe engagement in activities such as picnics in the courtyard, arts and crafts, walks through the courtyard, cards and games, and other opportunities that offer residents a variety of choices to be as active as they like. From book clubs to puzzles, trivia games to movies and much more, we strive to keep your loved one informed and engaged. Our goal is to provide a meaningful quality of life each day. At Mukilteo Memory Care, we are also proud to offer unique “Life Stations” on each floor. These stations create areas for residents to enjoy surroundings, as they mimic familiar tasks that have been part of their normal routine and lifestyle. Travel—Browse our travel area and “plan your next trip” or provoke fond memories of a special trip once taken. Sports—Cheer on the team! We have a special spot to get your favorite team’s statistics and watch those big memorable games. Front Porch—Rocking on the porch, sipping lemonade, reminiscing of the children playing and the neighborhood activities. Gardening—For those with a green thumb, you can get those hands dirty and watch your plants come to life. Kitchen—Homemakers have dinner to cook, and we can help! “Prepare” your family’s next meal. Laundry—So much to do and so little time! The family needs clothes and it’s time to “wash and mend”. Workshop—Things need a fixin’! Keep those hands busy and get to work. Soda Shop—Throw a coin in the jukebox and enjoy ice cream, malts, root beer floats and more while hanging out with friends at the neighborhood gathering place.